The HTML Alarm feature is included with the OAS Web Alarm product feature. The following sample illustrates how to display real time web alarms as well as enabling a feature to switch between real time and historical alarms. To use the HML Alarm control you must first register the Web HMI libraries. This is done with the OAS Service control manager with the Web HMI Registration. Define the exclusive port number and Node Name that is to be supported. The Node Name should be the registered domain name, IP address, or network node name that all clients will connect to from their browsers. Using SSL with Web Alarm is fully supported. 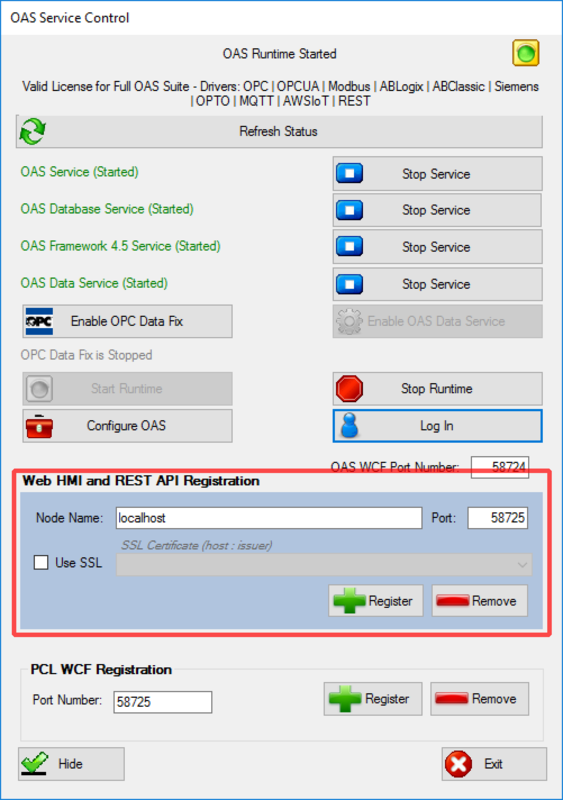 Read more about Configuring OAS to use SSL for Web and REST API products. Note: The Node Name should be set to the Network Node Name, IP Address, or registered domain name that all client applications will browse to. This will be the serverURL that all HTML clients will specify. Note: Networking to other OAS Services is easily supported by defining the IP Address, Network Node Name, or registered domain name in the HTML code for the client. Use the HTML HMI Wizard to define the remote networking nodes to multiple remote services relative to where the web project is hosted. Be sure to follow instructions for configuring Web HMI as the Alarm Control is an extension of that library. Note: As with the Web HMI configuration, you must specify the serverURL that includes the Node Name and Port Number that has been registered by the OAS Service Control Manager. Note: The id of the div element is “alarm1“, which matches the alarmid configured in the previous step.